Here’s the CURE for any weekend diet disasters or attacks of the low-energy Monday mornings you might be dealing with…In this fun 5-minute session, you’re going to hit a New-School Cardio and Abs workout. Done! 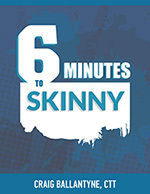 5 minutes of fat burning and belly flattening fun. You’ll follow that up with one of our fat burning shakes (recipes here) and then you can get on with your busy – and high-energy – Monday. Make sure to use a different workout on the other exercise days of your week.